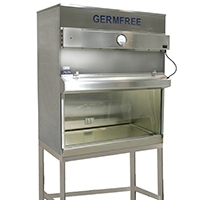 The Class II, Type A Vertical Laminar Flow Biological Safety Cabinet provides protection for the user, product and the environment from particulate and aerosol hazards. The work area is continuously bathed with positive pressure ISO 5/Class 100 HEPA filtered air to protect the product from contamination while an inward airflow protects the user. Approximately 70% of the air from each cycle is recirculated through the supply HEPA filter while the remaining air is discharged from the hood through the exhaust HEPA filter. 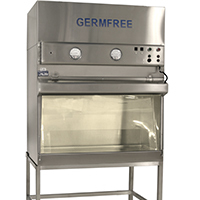 The BBF Series of Biological Safety Cabinets pass the Biological Tracer Containment Tests of the National Institutes of Health (NIH), the National Cancer Institute (NCI) and the National Sanitation Foundation (NSF). All units are NRTL listed with MET Labs to comply with UL1262.